Congratulations to San Jose, California's very own Joey "Jaws" Chestnut for winning his 7th straight Coney Island July 4th Hot Dog Eating contest. He broke his old record by literally inhaling 69 hot dogs in ten minutes and successfully defended his highly coveted Mustard Yellow Belt even though former Japanese champion, Takeru Kobayashi, did not particpate in this eating competition. I must admit, however, that although I'm into food, watching the Coney Island Hot Dog Eating contest on ESPN was both quite disgusting and humorous at the same time. It was kind of like I wanted to turn away since watching these people eat several hot dogs by the minute wasn't too pleasant with bits of food flying all over the place along with the sudden body convulsions, but there was a certain part of me where a sense of curiosity willed me to want to watch since I've never seen the whole competition in its 10 minute entirety. Having said that, I try not to think of the amount of calories that Joey Chestnut consumed in those 10 minutes, but hey it's the 4th of July! What better way to celebrate this country's independence than to eat a classic all-American food item...the hot dog. 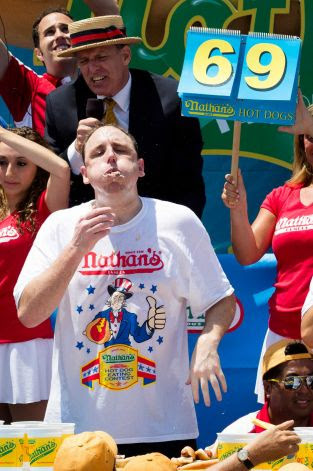 Not only does Joey Chestnut eat anything from hot dogs to chicken wings, but he does so in record time. Now that's what I call fast food. I think everyone is wondering how Joey Chestnut is able to avoid gaining weight. What's his secret? Perhaps it's just in his genes.